Game Day Celebrations with Honey! It’s that time of year again where we gather friends and family in front of the television for the game day showdown! 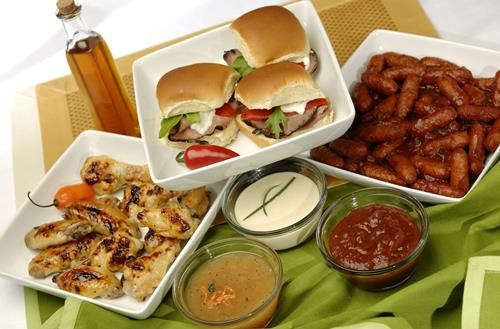 And a perfect game day wouldn’t be complete without a delicious spread of food. 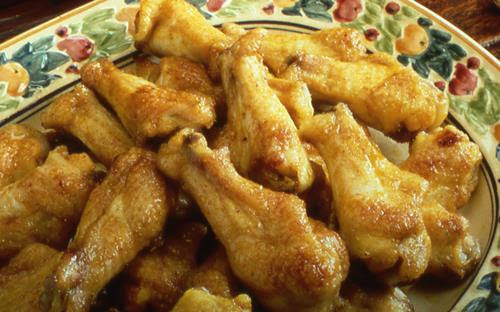 From our Easy Honey Chicken Wings to our Honey-Curry Vegetable Dip, honey will become your go-to ingredient this season! 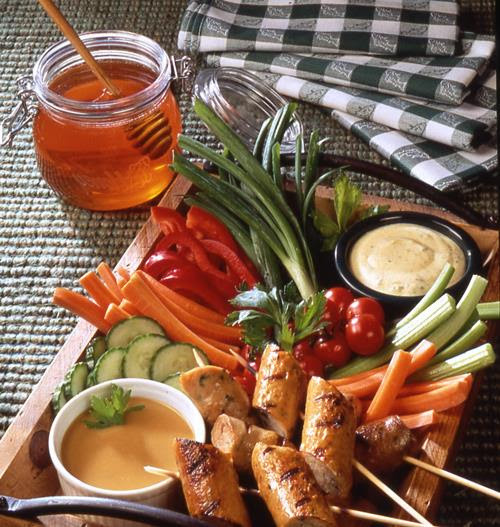 Honey can be used in so many ways – as a glaze or dressing, in dips and sauces or added to a scrumptious, sweet dessert to complete any game day party! Honey offers a unique flavor that complements both sweet and savory dishes. So whether you’re hosting the game day festivities or bringing a dish to a friend’s gathering, this honey-inspired spread will have everyone wanting to know what your secret is. In a small bowl, mix one tablespoon of honey, the lemon juice, one teaspoon of olive oil and salt and pepper to taste. Place the mixture into a resalable freezer bag and add the chicken breasts. Seal the bag tightly and gently shake it to cover the chicken breasts. Let marinade for 2 hours. Boil the chicken breasts in a saucepan. Once cooked, wait for them to cool. Finely chop the garlic, red onion and jalapeno peppers. Cut the zucchini into small cubes. Place all the ingredients in a medium-sized bowl and mix them with 5 teaspoons of olive oil and salt and pepper to taste. Preheat oven to 250°F. Spread vegetables onto a baking dish and cook them in the oven for 20 - 25 minutes. While the vegetables are cooking, cut the chicken breasts into small cubes and place them in a large bowl. Finely chop the cilantro and mix it into the bowl with the chicken. Once the zucchini cubes have lightly browned, remove vegetables from oven and wait for them to cool. When cool, add them into the bowl with the chicken cubes and the cilantro, and mix them with 2 tablespoons of honey, the juice of 4 lemons, 6 teaspoons of olive oil and salt and pepper to taste. Refrigerate for 2 - 3 hours. 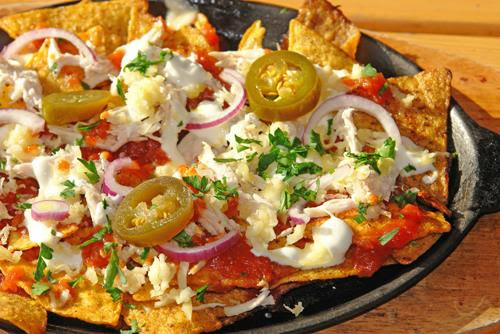 Serve over tortilla chips. Combine honey, soy sauce, chili sauce, garlic salt, pepper and red pepper sauce. Arrange chicken in single layer in a 9x13-inch baking pan and pour on sauce. Turn chicken over to coat with sauce. Bake at 350°F for one hour, turning over once. Cool slightly and serve. Using a small, sharp knife, cut each pepper horizontally near the stem and then vertically lengthwise to form a T. Open the pepper with care so that it won’t come apart and remove all the seeds and veins using the point of a knife or a very small spoon (even a baby spoon). Rinse each de-veined pepper to get rid of the remaining seeds. In a large saucepan, boil enough water to cover all the peppers, adding 1 teaspoon of salt for every 4 cups of water. Try a pepper; if you find it tastes too hot, add a teaspoon of honey and ¼ cup of apple vinegar to the water. Place all the peppers in the saucepan, leaving them to boil for one or two minutes. Make sure they are cooked, yet firm and crunchy. You don’t want them to lose their texture. Place them in an ice water bath (approximately 2 cups) to stop the cooking process and drain. For the shrimp stuffing: Cut the shrimps into small cubes. Place them in a medium-sized bowl and set aside. Chop the garlic cloves, red onion, cilantro and tomato. Add one tablespoon of olive oil into a medium-sized saucepan. Place half the red onion and all the garlic into the pan and cook over a medium-low flame. Once the onion becomes translucent, add the tomato and the shrimp. As soon as the shrimp become orange in color, add in the cilantro and allow to boil. Add pepper and salt to taste. Cook the shrimp for another five minutes. Remove from fire and allow them to cool. Stir in the cream cheese. Preheat oven to 350°F and stuff the peppers evenly with the shrimp mixture. 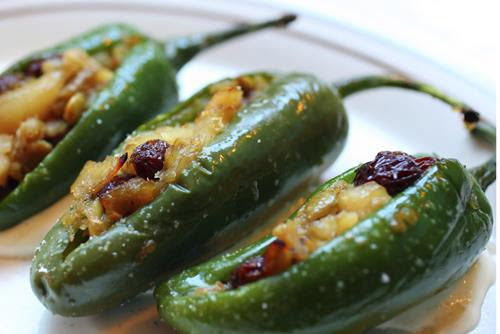 Bake the peppers for 8 - 10 minutes in order to heat and brown slightly. Remove from oven and let cool. Drizzle the honey vinaigrette over the peppers and serve. For the honey vinaigrette: Put the remaining red onion into a saucepan and fry lightly with one tablespoon of olive oil until translucent. Add the remaining vinegar and the remaining honey, as well as salt and pepper to taste. Add the ¼ cup of water and let the mixture simmer a few minutes to thicken the vinaigrette. Combine mayonnaise, honey, curry and vinegar; mix well. Refrigerate about 1 hour to allow flavors to blend. Serve with vegetables. Stovetop Method: In heavy pan, combine honey, butter, orange peel, and cinnamon. Heat to boiling over medium-high heat, stirring constantly. Reduce heat to medium and cook to 235°F. Stir in nuts, and continue to stir 4 to 5 minutes more, until nuts are glazed. Pour onto parchment paper or buttered foil and spread into a single layer to cool. Oven Method: Preheat oven to 325°F. Line a 13 x 9 x 2-inch pan with foil. Tear another sheet of foil the same size and place on counter; butter both. Pour nuts into pan; set aside. In a microwave-safe, 1-cup measure, combine honey, 2 Tablespoons butter, orange peel, and cinnamon. Microwave 60 to 90 seconds, stirring occasionally, until butter is melted. Pour honey mixture over nuts and stir until all are coated. Bake for 20 minutes, stirring every 5 minutes. Remove from oven and pour onto reserved buttered foil, spreading nuts into a single layer to cool. Store in airthight container.